The mix of textures and colours in this necklace make it a perfect piece for this seasons trends. 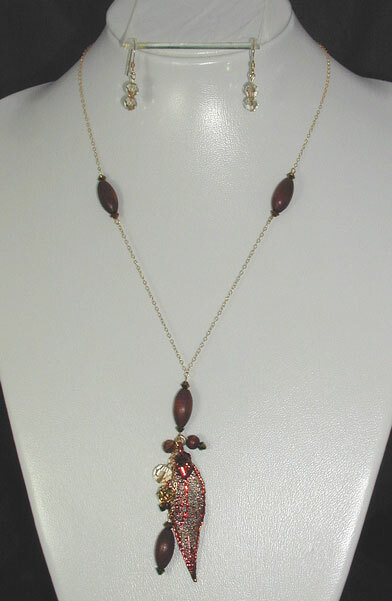 A combination of wooden and swarovski beads in browns,reds and golds all add to the warmth of this necklace. This necklace is 18" long made of gold filled (hard wearing)delicate chain, interspersed with oval wooden beads and coated swarovski bicones.It has a 4" drop consisting of more wooden and swarovski beads including a gold plated swarovski sphere covered in sparkling brown swarovski stones.Also included in the drop is a genuine evergreen leaf which has been coated in 24k gold and copper giving it a lustrous iridescence and still showing great detail. Accompanying this necklace are drop earrings made of swarovski round beads and gold filled ear wires.